We started eating our home grown lettuce last week and our broad beans and spring onions are almost ready to harvest. 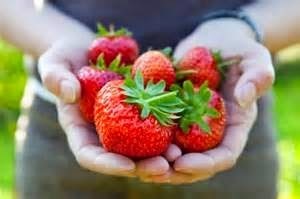 I can't wait for our juicy strawberries to turn to red and to enjoyed them without sugar, but with plenty of cream! If you have never tasted home-grown fruit and vegetables, harvested a few moments before preparing them for the table, then you have missed the most wonderful taste in the world. How can I say this? Well, like some, I have also tasted supermarket fruit and vegetables to make the comparison. Supermarket 'fresh food' is far from fresh and in fact quite the reverse, having traveled thousands of miles to reach the shelves - resulting in fewer nutrients and less flavour. Spinach stored at room temperature loses between 50 and 90 per cent of its vitamin C within 24 hours of being picked. Spinach available at my local supermarket has come from Peru - 6321 miles away. Folic acid, present in many green leafy vegetables, is prone to destruction with time and exposure to light. Some fruit and vegetables vitamin content is depleted by light, temperature and time. Vitamin C, the B vitamins and vitamin E are all important anti-oxidants that protect against disease, because they attack free radicals - the chemicals that cause heart disease and cancer. Imported produce can have lower levels of these vitamins, whereas freshly picked fruit and vegetables will contain maximum nutrients. And what about potatoes - surely we have enough fresh potatoes grown in the UK and within 2 hours of a supermarket? Pre-packed salad potatoes from Israel will not only have traveled 2,187 miles, but prior to that, many of them will have been stored for more than six weeks, with a significant loss of nutrients. So what is the answer? Switch to organic? No - an investigation by the ethical farming group Sustain into a sample shopping basket of 26 imported organic items found the contents had traveled 150,000 miles - equivalent to six times round the equator. Added to this is the fact the air transport pollution is a far greater contributor to the greenhouse effect than car exhaust fumes. 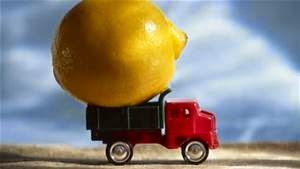 Why don't supermarkets put 'food miles' on product labels, so consumers can make informed choices? We should know when 'local' fruit and veg, with superior flavour, texture and quality are on our supermarket shelves or, as is more likely, available at our local farmers' market. Aren't you fed up of New Zealand Granny Smiths or American Red Delicious? 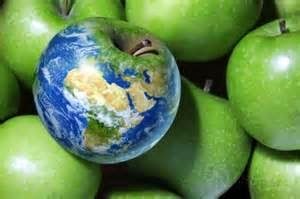 A study showed that 76 per cent of apples consumed in the UK are from overseas, many from outside the EU. Equally, fresh peas can lose up to 50 per cent of their nutrients within a week of harvesting. (Frozen peas, in fact, are generally a richer source of vitamins). The answer then is to either grow your own or take advantage of buying locally grown seasonal food which will give also you a more interesting diet. 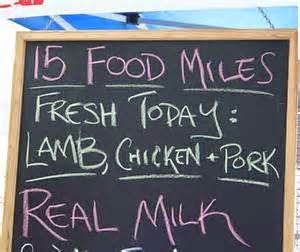 Food sold at farmers' markets must have traveled no more than 100 miles and very often it arrives from much nearer. Food grown in my allotment have traveled no more than 2 miles to get to my plate!